Barrel-aging beer is a bit of a mystical science – there’s something alluring about putting beer into a barrel and let the wood infusion generate a result. One never quite knows what the flavour is going to be like when a beer is put into a barrel, which is all part of the charm of this brewing art. In recent years, the popularity of barrel-aged beers has exploded. Whether it is bourbon barrels, whisky barrels, gin barrels, tequila barrels or wine barrels – if there’s a barrel that contained some kind of alcohol there will be a brewery that’ll put beer into it. The main hall of FoBaB at the UIC Forum in Chicago. Barrel-aging beer has been happening in Ontario for a number of years now (Ken Woods from Black Oak was the first to barrel in Ontario way back in 2005), but in recent years its popularity has taken off, with many established and new breweries having regular “barrel programs” featuring numerous barrel-aged beer releases throughout the year. Events such as Volo’s Cask Days, Sawdust City’s Funkfest and other festivals have celebrated local barrel-aged beers, and there’s even dedicated barrel brewery projects emerging, with Halcyon Barrel House within Beau’s and Amsterdam opening up a ‘Barrelhouse’ this fall. But for those who are truly barrel-aged beer fanatics, there is an event that towers above the rest. The Festival of Wood & Barrel-Aged Beer, commonly known as “FoBAB”, held annually in Chicago is a pioneer in celebrating barrel-aged beer. 2016 marked its 14th annual event (it was started in 2003 by Pete Crowley of Haymarket), making it one of, if not the oldest, festival of its kind in the world. If you thought barrel-aged beer was just bourbon barrel stouts, think again. 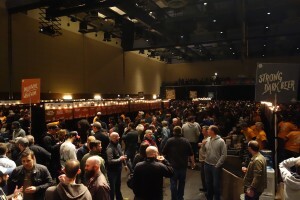 FoBAB brings together just about every beer style imaginable aged within just about every kind of barrel available. It’s a marriage of style and barrel that is staggering in its scope – there were over 400 beers and ciders available at the 2016 festival representing 25 different states in the U.S.A.
Just try and make a dent in this lineup. Consider the types of wood and alcohol barrels used to age beer at last year’s festival: Oak (American, French), Cedar, Palo Santo, Hickory, Sassafras, Rum, Whiskey (Bourbon, Scotch, Rye), Wine (Red, White, Chardonnay, Syrah, Cab Sauv, Pinot), Brandy, Apple Brandy, Gin, Port, Cognac, Fernet, Absinthe, Tequila, Sherry and Calvados. 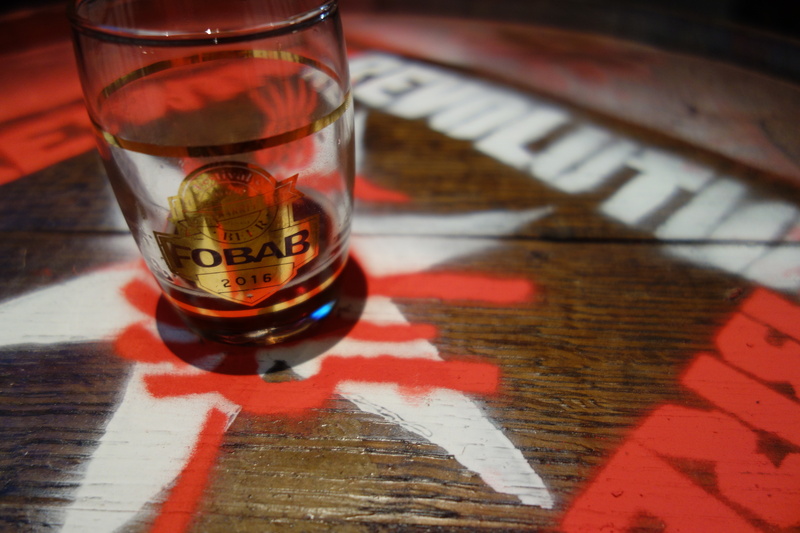 Things have certainly come a long way from the early days of barrel aging in a used whiskey barrel. Paired with the barrels of course the liquid that goes into them, and at FoBAB there’s a staggering diversity of styles, much more than the traditional stout. At FoBAB different styles are grouped into major categories including: Classic Beer, Barleywine/Wheatwine, Strong Porter/Stout, Specialty Strong Porter/Stout, Strong Pale Beer, Strong Dark Beer, Fruit Beer, Specialty/Experimental, Wild Beer/Brett, Wild Beer (Acidic) Sours, Wild Beer (Acidic) Sours with Fruit and Cider/Perry/Mead. And within those categories you can find just about every kind of sub-style imaginable. No longer are barrels used simply for a narrow set of styles – all beer can be barreled nowadays, often with delicious results. As the popularity of barrel-aged beers has grown, so has FoBAB. It is held at the UIC Forum, a large auditorium hall on the University of Illinois-Chicago campus, southwest of the Loop. The event is held over the course of a weekend, with an evening session on Friday and two sessions on Saturday. Tickets are always in high demand, but with the move a couple of years ago to the UIC Forum, they are generally easy to get on the first day of sales. Tickets for two of the three weekend sessions are still available for this year’s edition, taking place on November 10th and 11th, here. 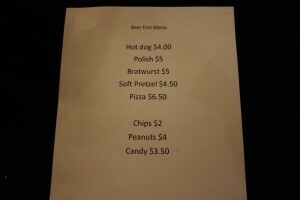 The “Food Program” at FoBaB. 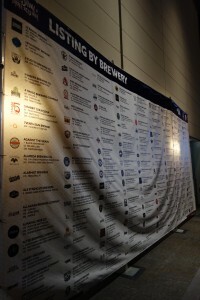 The festival is a well-organized one, and is most certainly beer-focused, which is refreshing. You will not find a food truck program at FoBAB, nor any kind of entertainment. The experience here is barrel-aged beer, plain and simple. One is here to drink beer, not get distracted by other things. And with so many kinds of beers available, it is good to stay focused on the task at hand. It is great to have a festival where it is “all-in” on its mission and fully delivers on the goal. Sometimes I feel like festivals try to be too many things, and in the case of FoBAB, the thing they want to be they do extremely well. The majority of the festival takes place in the main hall of the UIC Forum, with large banks of beer serving tables running up and down the space. Beer styles are colour coded and beers are numbered, making it fairly easy to find the beer you’re looking for. A nice addition to last year’s festival was the addition of a massive poster listing all the beers available, which helped to not have to fumble around with the program guide. Beers are served in a small glass, but with the strength of many of the beers and the variety available, small samples are appropriate for general enjoyment and selection. Sometimes there comes a point when your taste buds just need a break from barrel and wood flavours. Luckily FoBAB has a solve for that too, a “beer break station” in partnership with Chicago’s Revolution Brewing, where a number of their main lineup of beers (all non-barrelled) are available. A nice touch to get an IPA palate cleanser. Many a beer lover’s dream is fulfilled with pitchers of BCBS. One of the more interesting aspects of FoBAB is the presence of Goose Island. 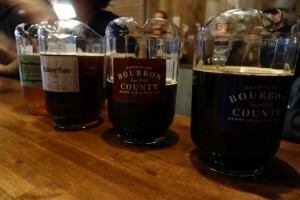 They always have a significant presence at the festival, and with the timing of the event being a couple of weeks before Black Friday (their annual release of Bourbon County Brand Stout), it acts as a preview for what’s to come. And Goose goes all out for FoBAB. At the event they were constantly tapping different beers over the course of the sessions, tweeting out each new beer – making their beer lineup ever changing. Whereas most breweries may only have a couple of beers, Goose brings a huge slate from their Bourbon County and Sour Sisters lineups. Around the craft beer world, there’s always some grousing and hand-wringing with Goose Island due to its ownership by Anheuser Busch. However, in Chicago the love is strong – the lineup for Goose Island was by far the longest of anything else, wrapping around the perimeter of the auditorium. A further unique aspect of FoBAB is it is also a competition where awards are given out across the style categories. 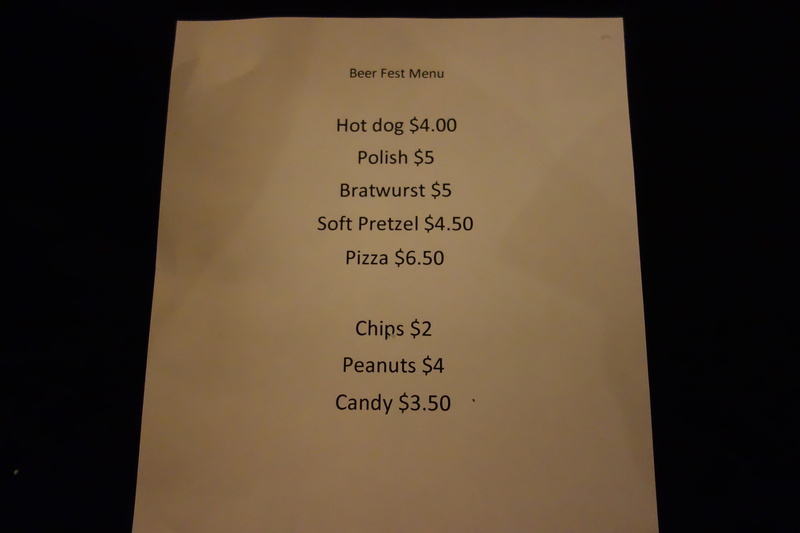 Due to that, they do not release the lineup of beers in advance – the general public only finds out when they walk in the venue and receive their program. It adds an element of mystery to the event itself, with online speculation common in advance to discuss what might be pouring. But breweries bring their “A” game in an effort to win – so drinkers are always guaranteed great brews. This is my favourite festival of the calendar, and it has been since my first visit back in 2013. 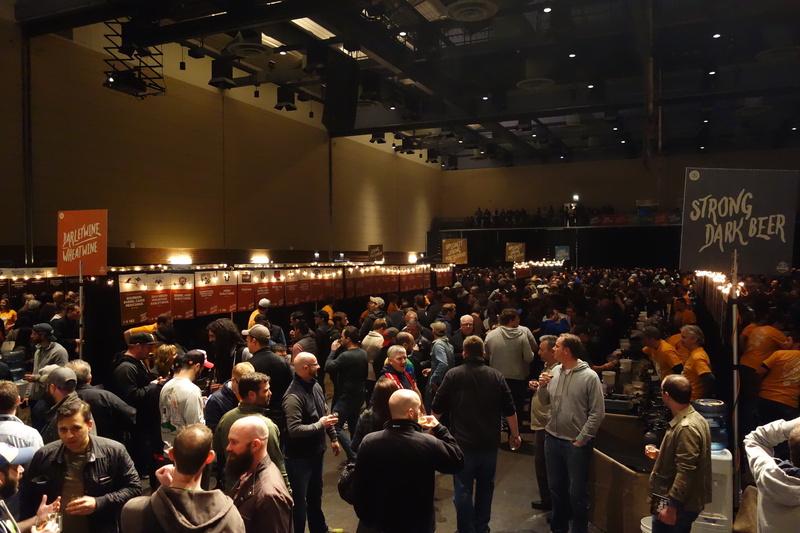 With such a great beer scene in Chicago it doesn’t take much to spark a visit, but FoBAB certainly makes a weekend in the city extra special. It you want to take your barrel beer game to the next level, you would not be disappointed in this.